Doomore is the 1224th highest place in Ireland. The best place to access Doomore is from Glenwood G619275 A to the east which has a Coillte forest carpark. It is found by following the signs for Coolaney from the N59 Sligo/Ballina road. Ignore the first forest barrier on your right and 150m later you'll see the carpark on your right. DIRECT ROUTE FOR DOOMORE: Facing west towards Doomore from the carpark, follow the deer fence south (left) for 100m to a bend and then follow the fence west through the forest. It follows an old wall which can be traced to a clearing and then continue out through a final short section of woods to the open mountain G614273 B. From here climb WNW to the top. 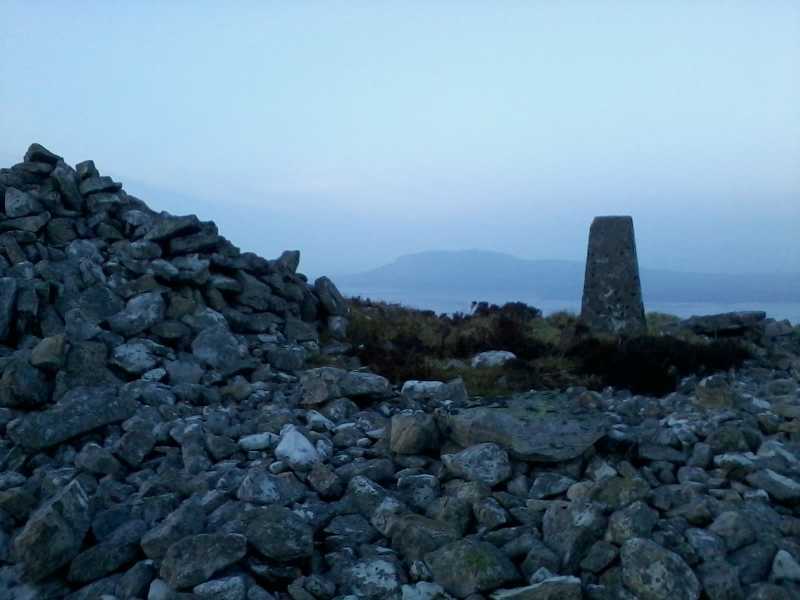 The summit is marked with a trig pillar and a surprisingly large carin at 272m G609274 C. The views from here are some of the best in the Ox Mountains with great views of Knocknarea, Benbulben, and across Sligo Bay to Slieve League. Return by descending the ascent route. LONGER, MORE VARIED ROUTE FOR DOOMORE TAKING IN DOOBEG: Facing west towards Doomore from the carpark, take the signposted steps at the NW corner of the carpark. This leads shortly to a forest road which can be followed west for about 1.5k. To the left of where the forest road ends G608282 D, a track follows a stream south uphill. This track becomes more faint as it gains height until it disappears after ~500m when the forestry to the west ends G607278 E.
From here you can continue directly to the col between Doomore and Doobeg or, for the adventurous, take in a more challenging approach by scaling the steep north face of Doomore. However a recommended detour from this point is to traverse west to explore the abandoned dwellings and (if you're willing to do some fence-hopping) an intact ringfort on the lower slopes of Doobeg. The going is rough in places but if you have the time its worth exploring. Doobeg G600274 F can be reached steeply from here by going south or more easily by contouring first to the west before climbing. Doobeg (unnamed on the OSI map) has an indistinct summit at about 250m in height. From Doobeg head east to meet a fence which leads to the col (keeping the forestry to your right). Continue east uphill taking care to avoid the steep north face of Doomore. The hill flattens near the top before reaching the trig pillar and cairn.